Buying a new pair of silver earrings is always a great way to lift up your mood. Whether you choose silver studs, dangle earrings, silver hoops, or other types of earrings, you are in for a treat. But once you get home, the question always makes its way to your mind. How do I best wear my new silver earrings? Which outfits should I try them with? Don’t worry, we are here to help. So no matter where you go, it’s always a good idea to know some basic styling rules for silver earrings. Read further to find out more. What type of silver earrings do you have? As you know there are many styles of earrings. From simple studs to elaborate statement earrings, there is practically a whole universe out there. So take a good look at your earrings because their style will determine your hairstyle. If you’ve just bought silver studs and want to try them on, you can wear your hair down. With most types of earrings (except maybe for hoops), the hair is always up for two reasons. The first one is that in order for your earrings to grab attention, they need to be visible. The second reason has more to do with logistics. Dangle earrings, for example, can get caught up in your hair. But with silver stud earrings you don’t have to worry about that. You can just use the advantage they provide to wear your hair down in a natural wavy style. The same goes for silver hoops, but these also look fabulous with a half-up, half-down hairstyle. If your new silver earrings are dangle, drop or cluster earrings, the best way to emphasize them is to wear your hair up. Whether it is a simple ponytail or an elaborate bun, it is up to you and the occasion, of course. A ponytail may not be a good idea for a formal gala, but it could be great if you are going to the grocery shop and vice-versa. If you want to buy a new pair of silver earrings but don’t know which gemstones to choose, let’s see what kind of gems look best in a silver setting. Of course, you can always buy a pair of silver earrings without gemstones but, as we often say, it’s best to have both styles in your jewelry box. Because silver has a unique polished look, it brings attention to some gemstones. Rubies, garnets, sapphires, amethysts or even diamond and cubic zirconia always look fabulous set in silver. Opals, on the other hand, or pearls, look best with gold and other warm colored metals. A pair of amethyst silver earrings will always be a fashionable and versatile accessory that you can wear on both formal and informal occasions. What clothes & jewelry to wear with silver earrings? There is a common misconception that one tanned and dark-skinned people can wear silver whereas gold is more appropriate for pale skin tones. Sure, if we think about the contrast, we might be inclined to consider this to be a true fact. But the contrast doesn’t have to come from the skin tone. In fact, it can come from the gemstone or even the color of your clothes. If you have pale skin, choose silver earrings with a vibrant gemstone, like sapphire or ruby. If, for example, you silver earrings feature a moonstone, they simply choose a vividly colored outfit, like a deep blue dress or a purple shirt. Regarding your other jewelry, silver goes great with similarly looking metals, like white gold and platinum. That is if you want to combine your metals, of course. It’s always safe to wear silver with silver, but if you want to try something new, go for silver earrings and a fine white gold chain necklace. If you are feeling bold, you can also combine silver earrings with gold jewelry, but you have to do it the right way. In this case, the right way means layering. So wear your silver simple studs with a couple of gold cartilage hoops. If this isn’t your style, you can always choose a silver linear drop earring with a crystal gold stud. 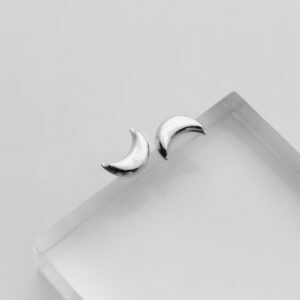 If you are looking for a versatile, elegant and unique pair of silver earrings, check out our Luna stud earrings below. They are trendy, incredibly charming and with an irresistible polished look. If you want to see more styles of silver earrings by Ana Luisa, check out our unique fine jewelry collection by visiting our online jewelry shop. If you enjoyed this article, please share it with your friends so that they too can benefit from our fashion advice. To learn more about jewelry, check out our other articles as well.